Poor little Blue, a run of back luck for sure. Hope that he makes a full recovery and returns to the nest soon so as not to miss any hunting lessons. I know that Lil' Dad and Niecey will take care of him. Thanks for the info and thanks to you especially, Jane. I will pass the kind thanks along to the volunteers who don't read this forum. Just got chased inside by MORE rain, tuned into the cam, and found Little Dad on his camera perch and one of the boys on the shield. Don't know which one, as they've both been up there. Tuned into the cam a bit ago to find Little Dad on his camera perch and Niecey half asleep on the stick. There is one juvie barely visible at the column. 2 kids at the column. One visable and you can see a little of the other. That must be where they are staying at night cause 2 am this morning one was there. For anyone who would like to make a donation, I'm providing a link to the Red Creek Wildlife Center where Blue and MANY other patients are. Red Creek operates solely on donations. Our local Audubon chapter has a donation box at our monthly meetings, and I always donate there. Wonderful caring people work there. There are several ways to make a secure donation. I'm having trouble creating a direct link. Still trying to create a direct link. Not having any luck. If I click on this, it DOES lead me to something that DOES work. And it's the same thing I typed in. Strange. Corrected an earlier typo. Thanks so much, Jane...and great idea..Let me see if I have any luck with those links.. Thanks MA. Your links worked. 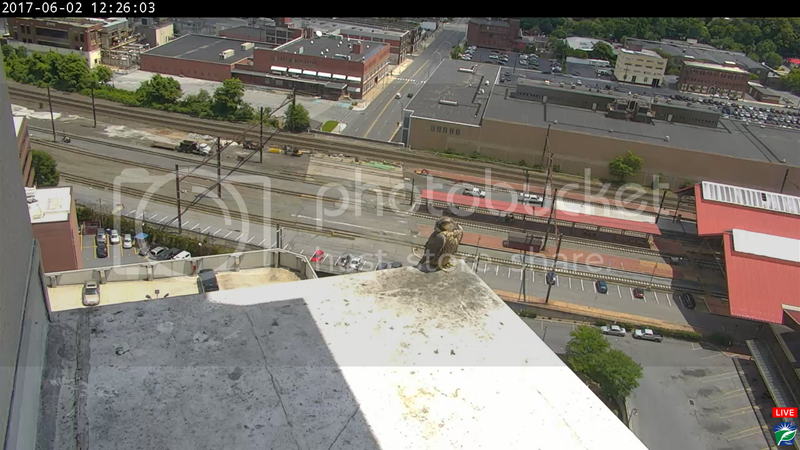 And right now Niecey is preening on the stick and there's another falcon over on the corner of the roof on the U Building. And it's Little Dad on the stick. I corrected a typo on my previous post. Both parents on the ledge, Niecey on the point and Lil' Dad on the stick. They have been there for a while. Don't see any juvies though. Thanks Jane for that link for the shelter where Blue is. Made a donation, hope it helps those who take care of all the little creatures who need it. Couldn't resist the beautiful evening, so made a spin downtown. Found Niecey and Little Dad without too much trouble, but saw no sign of the boys. Somewhere around 8:00 I spotted one on the roof of 333 Market. He flew to the corner of that building. About five minutes later a juvie flew in from somewhere and landed near the column. Then in five more minutes, the one on the roof of 333 came over to join his brother. I see them both at the column right now via my computer. thank you for the updates of blue. all we knew here was that he was put back on ledge. never a mention made o f him colliding with anything and being taken for Rehab. I have been concerned. many of us do not tweet so it was nice of Sgb to bring that over. Looks like Little Dad preening on the stick right now. There's another falcon over on the U Building roof, almost at the corner. What a lovely day it is here in Central PA.
One of the boys has been on/near the point for a while. Can't tell which one. Little Dad had been on the shield, but he's not there as I type this. Was having trouble getting the cams to function a bit ago, but they're fine now. Little Dad is on the point, and I just saw him cough up a pellet! Juvie on the ledge. He has moved over by the building now to get into the shade. Just got home and tuned in to the cam. Juvie was on the ledge about half way to the stick. It trotted down to the stick screaming at Niecey on the shield. He jumped up on the shield and Niecey flew off. Pretty sure it was Red. Am hoping to get downtown after dinner. Spent over an hour downtown tonight. Little Dad was on the window sill around the corner from the nest ledge when I arrived a little after 7. Found both juvies on top of the column, and Niecey over at the louvers in front of the U Building. There was not a whole lot of action, but I did see both juvies flying. Other than their big airplane wing spread they do when taking off, it's pretty hard to tell them from the adults in flight. One came in fron the roof of the U Building and made a precision landing on the stick. Thought it was Little Dad at first. One came to the column to roost for the night, and I can see him via the cam right now. The second juvie was on the glass cubby above the nest ledge when I left. Thanks so much for your evening report, Jane!! I'm just amazed at how well they are doing...Here's hoping that continues..and maybe Blue will be able to join them soon...of course, he'll have some catching up to do!! Its always a tricky decision about what to do when a fledgling is in rehab...Columbus went through that several years ago..it turned out ok..